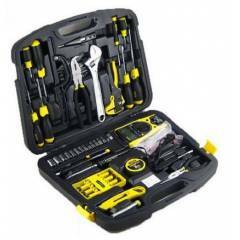 Tool kits form a vital part of every technician or industrial worker. To ensure a high level of perfection in industry and workshop based application, Moglix has come up with a new range of toolboxes to meet the needs of modern day technicians. The products that we offer have been sourced from leading brands in the Indian market such as GB Tools, Ambitec, Taparia, Bharat Tools and more. The tool boxes that we offer have been manufactured using the latest technology and comply with existing ISI specifications. The price of tool bags available at Moglix has been kept within a reasonable range to meet the buying power of home and industry based users. Each product included in the tools kits is produced using the best quality of raw materials. Therefore, they can ensure a high level of perfection in the applications they are used in. Screwdriver sets are indispensable for any type of home or industry based application. To meet the needs of industry based as well as home based users, Moglix presents a new range of screwdriver sets. The products that we have on offer as a part of our collection are produced using the best quality of iron and have been tested by experts to meet the quality standards in the industry. We have sourced these screwdriver sets from well-known brands such as Everest, Eastman, Dayton and others. To acquire the best deals, check out the new range of screwdriver kits online, at Moglix. 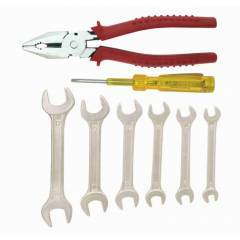 Hand tools are effective for use in innumerable applications. Aware of the importance of these tools, Moglix has come up with a new range of hand tool sets to meet the needs of both home and industry based buyers. The products that we are offering as a part of our collection have been sourced from leading brands such as Bosch, Cumi, Mitsubishi etc. The products sourced by us have high durability and can be used for years together. To acquire hand tools online at the best price, visit Moglix. Tools Storage cabinets play a major role in ensuring the storage and upkeep of tools. To enhance the longevity of tools that are used for industrial and domestic applications, Moglix has come up with a new range of storage cabinets. The products that we have on offer have ample space for storing tools of different sizes and designs. The products sourced by us have been manufactured by leadings brands such as Taparia, Eastman etc. To view an exciting range of tools storage cabinets, check out the new collection available at Moglix. Do you have deep interest in DIY projects? To fulfil the needs of buyers like you, Moglix presents a new collection of Do It Yourself kits. The products that we have on offer have been sourced from leading brands in this category as such as Taparia, GB Tools, Everest etc. 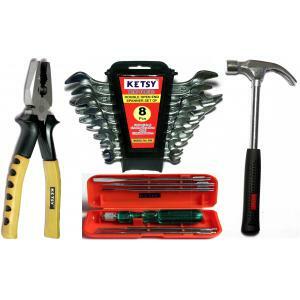 The DIY hand tool kits that we offer as a part of this range are suitable for industrial use also. They have been highly rated by experts and meet existing industrial specifications. To check existing deals on DIY kits, check out the new collection offered by Moglix. 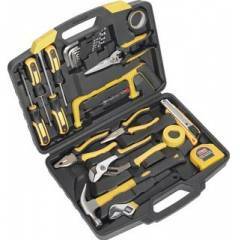 Are you looking for special offers on tool kits for home? To meet the needs of home based buyers, Moglix has come up with an exciting collection of home tool kits with attractive special offers. The products that we have on offer have been sourced from well-known brands such as Bosch, Crompton Greaves, Eastman etc. The product price has been devised to suit the needs of buyers. To acquire the best deals on home tool kits, select from the new collection available online at Moglix. Die sets are utilized for cutting threads into a cylinder(bolt). Aware of the importance of die sets for industrial workers and technicians, Moglix presents the latest collection of die sets that are available in the market. The products that we have on offer in this category have been sourced from Metabo, GB Tools, Bharat Tools and other brands. To acquire the best quality of die sets, select from the new range available online at Moglix. Socket sets are widely used in car maintenance and DIY projects. To meet the rising existence of buyer, Moglix has come up with a new collection of socket sets that match up to the existing quality standards in the industry. The products sourced by us have been manufactured by eminent brands such as Taparia, Eastman, Ambika etc. The price of these socket sets have been kept within a reasonable range to meet the budget of buyers.